Home » cricket news » India Vs England, 2nd Test: This England cricketer has made this unique world record that will leave you in shock! India Vs England, 2nd Test: This England cricketer has made this unique world record that will leave you in shock! 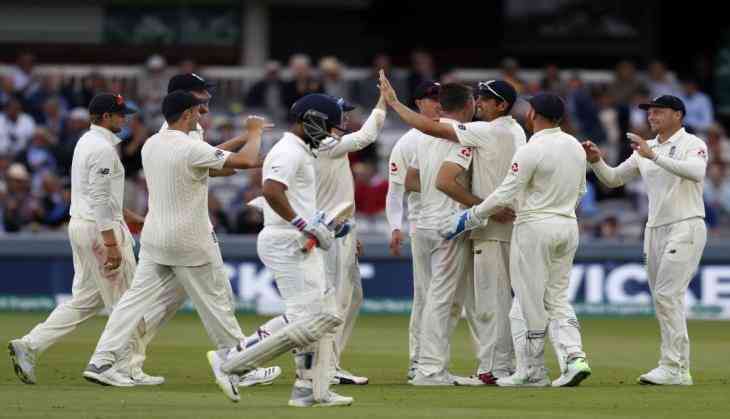 In a rain interrupted day, Virat Kohli's brigade failed to counter the swing of James Anderson (5/20) and Chris Woakes(2/19) and fell like ninepins as England bowled out Indian team for a miserly 107 in 35.2 overs on the second day of the second test at Lord’s. James Anderson scalped his 26th five-wicket innings hauls in Tests that took the 36-year-old’s career tally to 549 wickets. At Lord's cricket ground England's paceman James Anderson has made a world record of scalping most no of wickets against a particular team. He has broken the world record of former Pakistan skipper Imran Khan when Anderson takes fifer. Imran Khan had taken the 94 wickets against India while Anderson scalps 95 wickets against India. West Indies cricketer Malcolm Marshall has scalped 76 wickets.